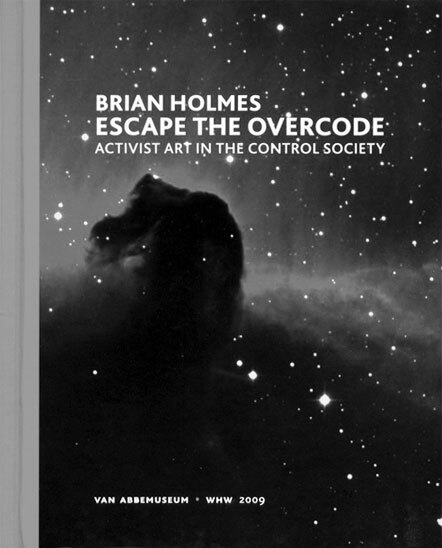 This new collection of essays by cultural critic and activist Brian Holmes was published by the Van Abbemuseum in collaboration with the Zagreb-based curators’ collective What, How and for Whom (WHW) as the second publication in the Van Abbemuseum Public Research Series (VAMPR). The series focuses on bringing new knowledge about the political possibilities of art and its institutes into the public domain. Escape the Overcode is appearing at a time when there is renewed interest in the work of Gilles Deleuze and Félix Guattari. Particularly Guattari (1930–1992), unpublished work of whose was recently made available, is an urgent reference for Holmes in his analysis of the present-day production of subjectivity and of its de-programming. The 21 essays in Escape the Overcode first appeared on his blog Continental Drift, and were composed over a period of two years. The collection is a ‘quod erat demonstrandum’ of a Guattarian analysis of contemporary world capitalism. In those two years, Holmes travelled a great deal (Europe, the USA, Asia, Latin America), conducting extensive ‘extradisciplinary’ research into various activist art practices on the spot. Using this as a basis, he has made a diagnostic portrait of the times that provides insight into the possibilities for a truly effective, subversive art: art that is a counterforce to the ‘overcoding’ produced by today’s global capitalism. The term ‘overcoding’ is a fairly problematic concept borrowed by Holmes from the work of Deleuze and Guattari – in particular, the essay ‘Apparatus of Capture’ in Mille Plateaux. Its problematic aspect lies in its ambiguity: on the one hand, it refers, in line with Deleuze and Guattari, to the threat posed by the totalitarian forcing into line and standardization brought about by a completely integrated world capitalism through the overwriting of all domains with a single code. On the other hand, it can be used to designate the overwriting that occurs when dominant codes of institutional regimes of meaning mix with local meanings. Holmes primarily deals with the former, which he sees confirmed in Guattari’s later work – in which Guattari talks about the last phase in the development of capitalism, when overcoding reaches a maximum. This totalitarian overcoding, also described as cognitive capitalism, not only plays a role at the scale of economic transactions but also at the scale of the production of a specific, controlled form of subjectivization, of an experiential regime. The overcoding is a unifying movement that makes marginal voices and experiences subordinate to a single overcode, a kind of supercode that not only has repercussions for symbolic communication, but also for the ways in which imperative models of interaction regulate, standardize and organize. An important component of this theory is that our network society, with its ubiquitous computer communication and symbolic exchange, lends itself extremely well to complete control over specific forms of subjectivization. In his essays, Holmes reports on artistic practices that operate in the border zones of what still can be termed art, but that all support or effect a transformative process that disrupts the ‘overcoding’ and shirks institutional control. An art that in many cases shuns the white walls of the museum, and in its appearance in public space relates to its viewers in a different way. These are practices that can be interpreted as reprogrammings of the imperative subjectivity propagated by the global information machine. For Holmes, this reprogramming is particularly aimed at a sensory, affective recalibration. Escape the Overcode starts off with three introductions, each of which deals with one part of the book’s underlying theoretical framework. The first forms the basis for Holmes’s interpretation of art practices that appear to escape the overcode; in the second he presents a case in point, Marcelo Expósito’s film First of May (also published in Open no. 17); lastly follows a more traditional introduction in which he affords the reader insight into his argumentation. The first introduction is also an affective manifesto, in which Holmes breaks a lance for a new concept of art based on the thesis that expression is an affective gesture that has the inherent quality of freeing contacts between people. In short, artistic activism is affectivism, and as such opens new, expanding territories of alternative views and experience. In this seemingly simple equating of terms, Holmes relies heavily on the preliminary work Guattari developed in his alternative psychiatric clinic La Borde and his activist practices (free radio, eco-activism, schizo-analytic cartography). In that work, Guattari describes the importance and significance of art in our times: in his view, art offers the only workable model for throwing off a prevailing subjectivity, by offering new modalities of experience that are based on an autonomous practice and rooted in the here and now. For Holmes, the functioning of locally bound cultural practices and their liberating effect are directly related to a global front where the reprogramming of the symbolic order needs to be fought out. For despite his decidedly engaged political agenda, Holmes apparently considers regular politics no longer capable of being a significant factor for any form of positive social emancipation or change. Like an anthropologist of Guattari’s ‘integrated world capitalism’, Holmes has composed a book that attempts to weave together a cartography of subversive global art practices by means of local examples. In order to give shape to this theoretical cross-linking, Holmes shuttles – sometimes a little too didactically, sometimes uneasily or almost ecstatically – between different and hard-to-compare scales of aggregation. He himself calls it ‘an almost fractal interplay of scales’. The reader must therefore be prepared for the fact that Escape the Overcode can jump from a molecular, affective scale to a more surveying, cartographic scale of interpretation and analysis (in this regard, Holmes introduces the neologism ‘geocritique’). Like Guattari, he jumps from psychoanalytic theories to theoretical system analyses, then links up factoids from popular economics with biological models. This extradisciplinary approach seems to tie in with how the art world currently speaks of ‘artistic research’, which to hard-core scientists often is an abomination of superficial appropriations and half-understood applications. Holmes’s form of discussion avoids such scientific assessments precisely because it attempts to be an expression of an aesthetic/ethical imperative aimed at attacking sacred cows, with the goal of fuelling a new sensibility and passion for investigation out of a deep sense of urgency. The book is not so much an exegesis of a ‘grand theory’ about the production of subjectivity under new geopolitical conditions, as it is a personal account of an inspired phase in a researcher’s practice. Escape the Overcode above all is a call for experiments of thought and offers a variegated toolbox for conducting them. In the wake of the revival and reintroduction of the mental legacy of Deleuze and Guattari, there is a good chance that Holmes’s toolbox will be an inspiring aid for many people in lending significance to the molecular revolutions in the arts.